In only the second year that the Super Bowl has been viewable via live-streaming, ad placements for this ‘second screen’ have virtually sold out. Legions of advertisers were drawn to this alternative second screen ad placement due to the rapidly increasing comfort of viewers with streaming video. AdAge.com reported on how digital has turned coverage of sporting events into a whole new ball game. Perhaps another reason for the popularity of digital advertising is that ad prices ran considerably less. CBS declined to give an exact price range, but NBC sold placements around its live-streaming coverage for between the high six figures to lower seven figures last year. Considering that traditional TV ads have averaged a price tag of around $3.8 million, digital advertising offers substantial savings that enable advertisers to reach that coveted Super Bowl audience and gain the prestige of being a Super Bowl sponsor. 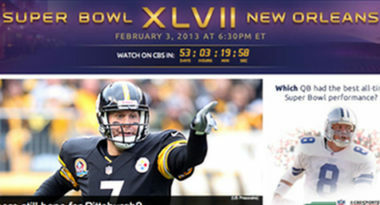 Sports fans who opt for live-streaming of the Super Bowl will see ads mostly in the form of video commercials that run during breaks in the game and companion promotions that are placed around the CBSSports players periodically throughout the game. The ads will be from both the pre-game and game-time broadcasts on CBS. NBC pioneered live-streaming of the Super Bowl when the network hosted the event last year. It marked the first time that the big game was broadcast in an unconventional way by a major television network. The move proved extremely successful and reached 2.1 million unique viewers. Over the past year, mobile usage has grown exponentially. This has led numerous TV networks to create digital content that complements a variety of television programs and can be simultaneously accessed while watching the actual programs on TV. This synthesis of digital and television—second screen—has allowed networks to incorporate popular social media and high-tech features into the TV viewing experience. CBS executives alluded that many of these digital features will be included in this year’s Super Bowl broadcast, such as social networking tools and advanced camera angles for groundbreaking coverage. Since the Super Bowl is such a promotional powerhouse, ads on both traditional and digital screens are sure to score big with the viewing audience. To learn more about the digital ‘second screen’ and the latest trends in cross-platform marketing, contact MDG Advertising today at 561-338-7797, or visit mdgadvertising.com. MDG Advertising is a full-service advertising agency and one of Florida’s top digital marketing companies. With offices in Boca Raton, FL and New York, NY, MDG specializes in developing targeted cross-platform marketing solutions, exceptional creative executions and solid branding and media buying strategies that give clients a competitive advantage. Our core capabilities include branding, logo design, creative, digital marketing, print advertising, mobile marketing, media planning and buying, TV and radio, online video, website design and development, content marketing, social media marketing, and search engine optimization (SEO).